This British made High Security 5 Lever Mortice Sashlock is available in a range of finish options to match our other ironmongery products and features a 20mm throw solid brass deadbolt with hardened steel anti-saw rollers, hardened steel anti-drill casing and 5 pick resistant levers. Certified to BS3621 and recommended by insurance companies and the police. This lock is an excellent choice for both high quality residential and heavy use commercial applications and is offered with the option of "Standard Sprung" or "Heavy Sprung" handle follower. 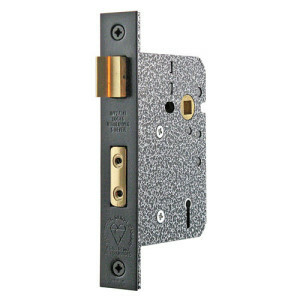 Easily reversible to suit left hand or right hand hung doors and suitable for fire rated timber door sets in accordance with current regulations. Select "Standard Sprung" for lever handles with integral springing in the rose or backplate or "Heavy Sprung" for handles described as being un-sprung. To avoid fixing screws fouling the latch body use handles with horizontally opposed bolt-through fixings or with backplates where fixings positions are adequately spaced. NOT recommended for use with door knobs. 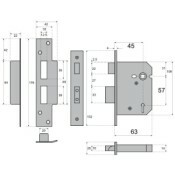 This lock is supplied "keyed alike" which refers to a quantity of locks supplied as a passing group all operated by the same keys. 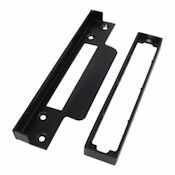 This option is a popular choice as it reduces the amount of different keys needed for multiple doors and can be used for front door/backdoor scenarios, stable doors or multiple garage doors for example. 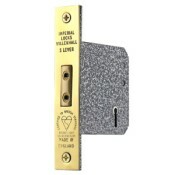 Our standard 5 Lever Keyed Alike range covers both deadlocks and sashlocks in 2.5" and 3" sizes so your group can contain a mixture of any of the locks detailed in the Related Items section further down the page. Certified to British Standard BS3621 : 2007 and successfully type tested for conformity to all of the requirements of BS EN 12209 : 2003 including the additional requirements for fire/smoke door use - certificates are available on request. 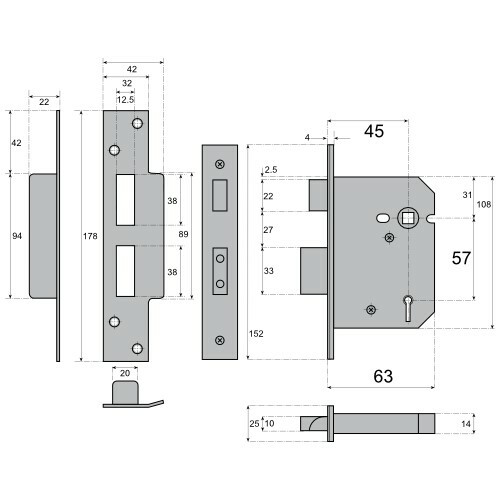 These locks are stocked in component form in quantities normally sufficient to fulfill most orders for single passing groups for immediate despatch. Where we are temporarily out of stock, and for orders containing multiple groups, you should allow approximately 10 - 14 working days for despatch depending on the finish chosen. Please contact us if you would like to know the stock situation prior to placing your order.